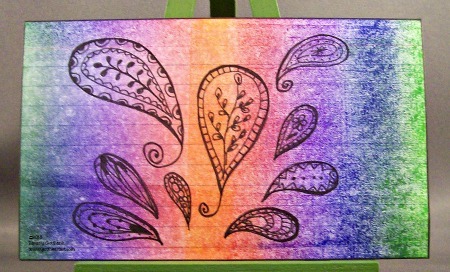 With a brayer and a Kaleidacope ink pad I created the Rainbow background then did some tangling of Paisleys with a fine point black Sharpie marker. Day 7 goes in the box. love the way you did your own paisley designs--I can't get the whole zentangle thing but you make it look wonderful even on a quick piece like this!